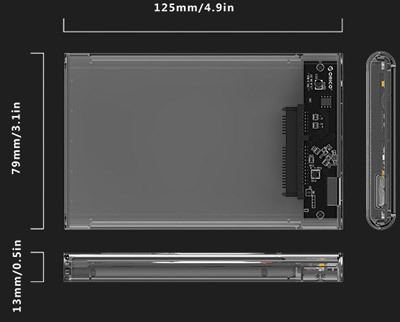 ORICO 2.5 inch transparent hard drive enclosure adopt USB 3.0 to SATA chip, theoretical speed up to 6Gbps, about 10X faster than USB 2.0. 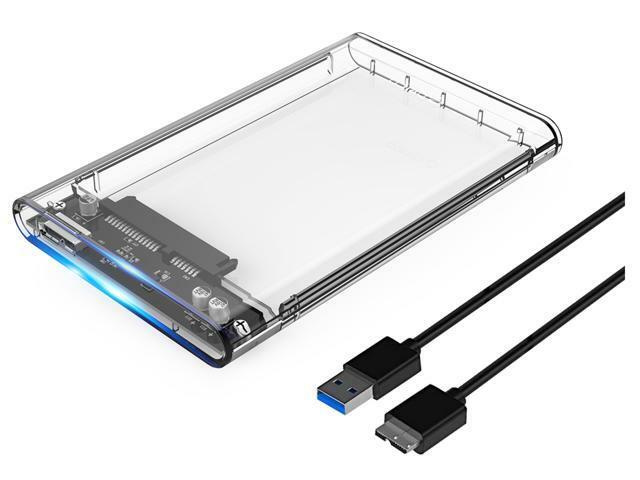 Supports UASP protocol, turn a 2.5" SATA III HDD / SSD into an external hard drive that can connect to your computer through USB 3.0 .has a maximum data transfer rate of 5Gbps, 20% faster than traditional USB 3.0. also support max 2TB external hard drive and 7mm / 9.5mm SSD , 2.5 inch SATA III hard drive (backward compatible SATA II /I).Creative transparent design, vibrant transparent casing with PC material, help distinguish which hard drive is inside easily, designed to be a beautiful addition to your desk. Mini portable size, It's ideal choice for office or business trip use. 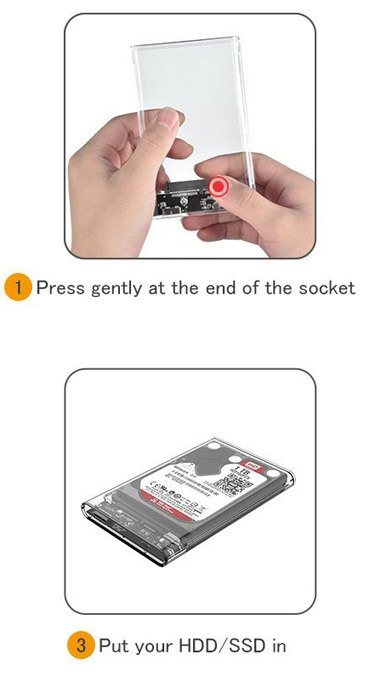 Note: * It perfectly fits 7mm and 9.5mm 2.5" SATA SSD or HDD with maximum capacity of 2TB. 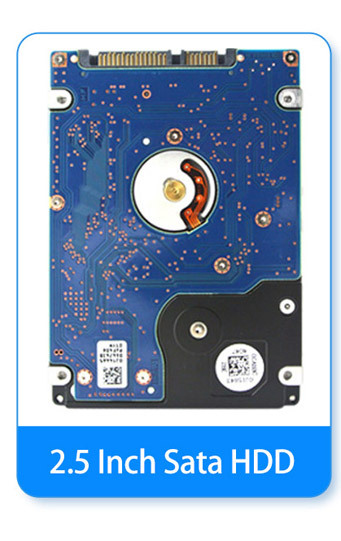 12.5 mm hard drives are not recommended for this product, and the SATA SDD and HDD are not included. The SuperSpeed USB 3.0 port delivers a blistering data transfer rate of up to 5Gbps- around 10 times the bandwidth of the current USB2.0, letting you transfer a large amount of data in seconds. and is backwards compatible with High (480Mbps) and Full (12Mbps) speed standards. the PC material casing helps protect the hard disk drive, while effectively drawing the heat away from the drive for reliable performance. 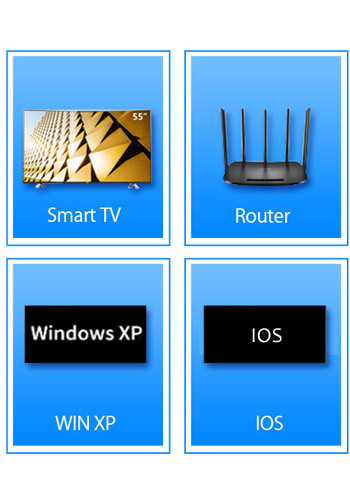 UASP is supported in Windows 8, Mac OSX (10.8 or above), and Linux. In testing, UASP performs with a 70% faster read speed and 40% faster write speed over traditional USB 3.0 at peak performance. Save time, with file transfers up to 70% faster than traditional USB 3.0 when used with a UASP supported host. For universal compatibility, the JMS578 can be connected through USB 3.0 - with transfer speeds up 5 Gbps. USB 3.0 provides support for UASP, which delivers performance up to 70% faster than conventional USB 3.0, when paired with a UASP enabled host controller. the combination of USB 3.0 and UASP allows you to utilize the full potential of your SATA III hard drives. 1. In order to reach UASP acceleration function, please make sure your device support UASP. 2. Due to the different of device, system and hard disk, transmission performance of USB3.0 may be different. Supports all standard 7mm/9.5mm 2.5 inch SATA I/II/III HDD and SSD up to 2TB(Max).Tool-free installation; hot-swap plug and play; LED indicator; No Reboot or Additional Driver needed. The 100% screw less design saves you time and effort in assembly. you can get it up and running in 3 second; no professional tool or expertise is required. Equipped with universal plug and play technology enables ease of installation and dismounting. there is no need to reboot and no driver is needed. 6. Wide compatible and strong expansion. 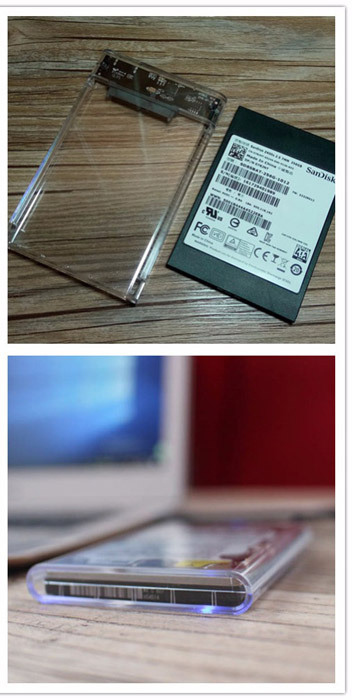 Compatible: Fit for 2.5 inch SATA I/II/III HDD SSD , Support 2TB Mass storage. 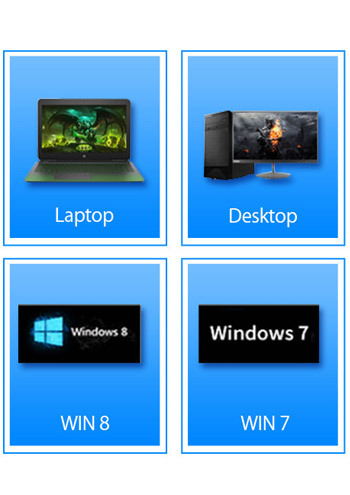 Supports various mainstream operating systems and can also connect most terminal equipment. 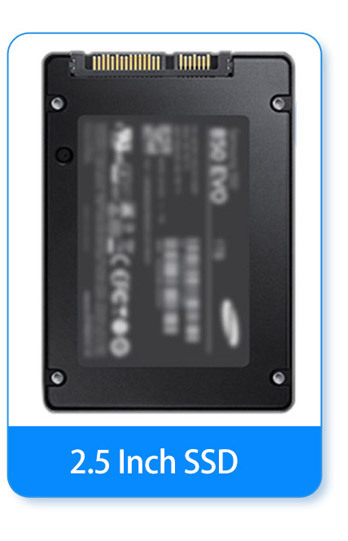 Pros: Easy to install/remove the hard drive. Looked like any connected USB drive. Cons: The plastic covering that came on the drive for protection was a little difficult to remove but very very minor. Other Thoughts: I would buy this drive again. Cons: - None that I can find. Other Thoughts: - So happy I found this product. I've been looking for an enclosure like this for a while to, not only utilize, but to display my older HyperX 3K SSD. Thanks Orico! Thanks Newegg! Thanks for your kindly feedback. Hope to deal with you in the future. If you have some other questions, hope you can be free to contact us. Cons: There should be rubber feet for the bottom or something. I don't like having to put it down flat on the clear plastic bottom. Other Thoughts: If you can snag this for ten bucks, it's pretty hard to complain. Pros: Does what it’s supposed to do. Easy to use. Cheap. Other Thoughts: Used it to clone an ssd for migration purposes. Did what it was supposed to do first try. Probably won’t need to use again. A+. 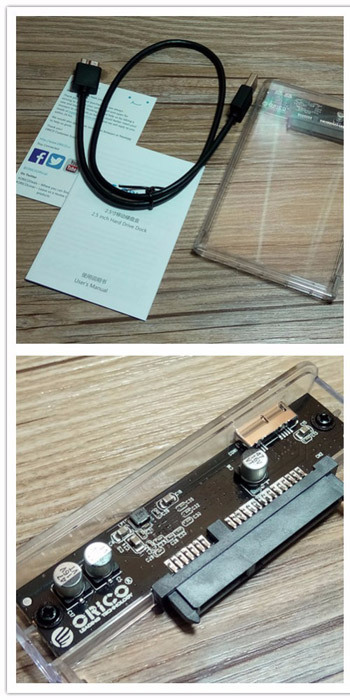 Cons: Not as robust as a metal case, obviously, but if you don't have an environment where you need sturdier boxes, then it is a good deal for the money. Other Thoughts: I bought 2 more after my first one, if that tells you anything. Pros: I purchased the 2 enclosure set. Enclosures work well if it has a good cable. Cons: Orico support is very poor. Other Thoughts: After 3 days of runaround about a bad cable that came with the set, I would not recommend their products to anyone unless you like to be run around in circles by their support. Had one cable that worked well but the other cable had read/write problems. We understand your disappointment, but you are our value client, we sincerely hope we can do something to make you feel better. Pros: I used this when I upgraded a PS4. Then I used the old PS4 drive as a DataBase which could be plugged into and out of multiple home computers. I feel sure that I could have placed Linux Mint on the drive and stored my databases on the same drive and used it to boot other computers. Very Useful.